I have revised the After Effects To Blender exporter to update it for Blender 270a api changes. See post #44 for caveats with this version. As far as tracking and camera matching tasks, however, we are still in untested waters. The concept behind this Adobe Javscript (.jsx included in the attached ZIP file) is like any other exporter. The exporter scans the host application for data and generates output in a different format. The format, in this case, is Blender 2.70a python. Select the layers you want to export in your After Effects comp. Click the export button and wait for python generation to complete. Exit or Hide After Effects. Locate the generated python script (many times it just appears on the desktop). Open Blender 2.70a or better and load the generated python script into a text window. Run the code in that window. 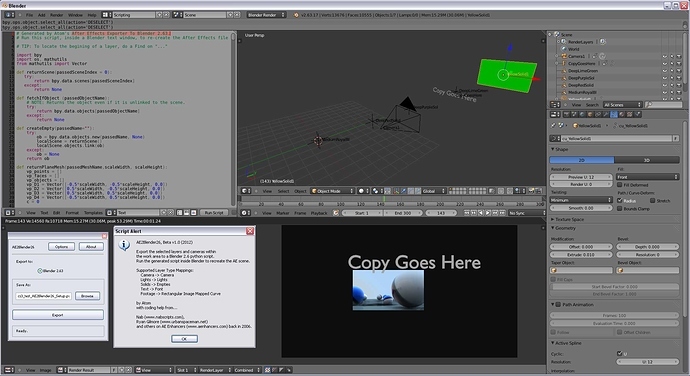 The code in the python script will attempt to construct a scene similar to the scene in After Effects. It now works in CS5 &CS6 (yeah!). The correct FPS is being relayed to Blender from After Effects. Text from After Effects appears as extruded font object inside Blender. Footage layers appear as correctly sized planes with a material applied to them pointing to the footage. Axis orientation for the whole Blender scene is rotated 90 degrees along the x-axis to match After Effects. Lens default value more closely matches After Effects for a tighter Pixel-to-Pixel match. I am calling these attempts because the code is still in that state. Solids are exported as animated empties. Text layers from AE are converted to actual 3D font objects in Blender. Lots of testing needs to be done. I have tested it on a couple of scenes with CS5 and CS6 only. So further testing on creative cloud versions is needed. Nice to know. I cloned the Lightwave exporter when I began my 2.49 script. Next time I am working on the script I’ll include that as a change. So if you exported an animated camera, how did you rotate it 180 degrees in Blender without losing the animation? So glad i found this thread. If I use the script in AE CS5 on a Mac the resulting python script seems to have no line breaks when opened in any blender version. Hey, Atom, just saw this thread, and you seem to be the only game in town! Any further progress on getting this guy going for Blender 2.6? I can get the camera to export into Blender, but it is off-kilter, and I’m unsure of how to re-orient it. I did parent the camera to an Empty, but I guess I’m screwing it up since it pivots the camera around the origin like a big hinge. Anyway, my test consists of a simple text layer and a camera movement. The camera exports, but when I try to include the text layer it sits on “Checking for Animation” for a long time. Does this just take a long time or am I missing something? Thanks for your work on this script, it could be EXTREMELY helpful in my future projects. Has there been any progress in this area? After Effects has the new camera tracker now and it would be great to do everything there, export the camera data and some solids into Blender, do the 3d stuff, then just render and finish all the stuff in AE. I’ve been looking for a solution before Blender introduced its own camera tracker, we had The Foundry Camera Tracker in AE which was a dream come true. I think integrating apps is the future - 3dsmax and After Effects have this kind of relationship already. Thanks Atom for doing a great job before but the script doesn’t transfer camera rotation animation in CS5.5 and CS6. Is an update possible? Anyone? This is my “placeholder post.” I am trying to download the script linked above, but I haven’t posted ten posts yet, which I think is the reason I can’t download it. Rather than filling up the forum with 10 extra posts when I have nothing to say, it would be great if the forum moderators could help me to access the link to the script. Thank you. Number of posts shouldn’t have any affect on you downloading files. What problem do you have when you try to get the blend file ? There was an attempt at converting Mask data to Blender curves. if anyone is interested. but with the new-fangled mask tools, i can’t imagine anyone wanting to start rotoscoping inside an external app any more. With Mask editing in trunk, mask data should be imported as actual mask! Sometimes AE’s orientation (not rotation) comes through but only in one axis and still not correct. Swapping Z for X etc. in AE wouldn’t be a problem if just the numbers would go through, we could use expressions and fix it, but we really need somebody to fix the script. If it worked at least in CS5 (I’m aware that not everybody has updated to CS6 yet), that would be a great thing. I’m really trying hard to trust Blender more and introduce it into my workflow in one of the projects I’m doing now. Thanks in advance! Ok, so I took another stab at it. I have updated the script from Alpha to Beta. I feel it works a little better now and I have corrected the CS5 bug so it should run in After Effects versions other than CS3. I was using a depreciated call to activate the OS dialog. That has been corrected. I am calling this release Beta v1.0. Feel free to test away and post bugs/suggestions! Sorry for replying so late, I was away and without regular Internet access. Just imagine my big smile when I came back and noticed your update Thank you so much for doing this Atom. I’ve run the script in CS6 in a crane shot - it seems that the motion is reversed (the crane in AE goes up, in Blender it goes down) but the most important thing is that the rotation and other movements are being transferred, not like with the previous script used in versions above CS3. I’ll test it more in the following days and post some conclusions. I have one big project coming and I would love to use AE with Blender on that job, which is impossible without your script. If you have a small CS5 (I don’t have access to CS5.5/CS6 at this time) After Effects aep file that shows this reversed up/down problem, post it here in a ZIP file and I’ll take a look. When I read your post it made me realize I had not tested UP/DOWN camera movement, just movement into the scene via Z translation. I’ll prepare a file tomorrow when I get access to CS5 and post it here. Thanks so much Atom! Ok, I’ve created two simple compositions in AE CS5, highlighted all the solids etc, run the script and then opened it in Blender 2.63a (after deleting default elements in the scene). I’ve done no changes afterwards, just saved the files. AE normal composition - I’ve just added a 3d solid, animated the camera a bit and added two text layers. They look completely different in Blender in the first frame - they’re out of frame. Thank you for your time and effort Atom I’m looking forward to your findings.